Nubar are always bringing out fabulous new collections. Two of their newest collections are the 'Finest Silks' and 'Venetian Glass'. 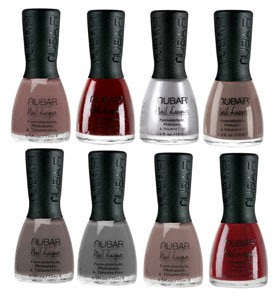 Traveling the Silk Road for inspiration, nubar introduces Finest Silks, a collection of eight luxuriously silky shades which provide complete coverage in two coats. Effortlessly feminine with a thoroughly modern palette, these lovely new shades flatter every finger and lend themselves to the fluid, graceful silhouettes see on runways around the world. Just as women love the shine and drape of silk, the love the sophistication of a classic nail polish. The shades of Finest Silks collection range to be universally appealing and beautiful on every woman. There are some really lovely colours in this collection, if you love your neutrals then these are perfect! Get set to shimmer this winter with the Venetian Glass collection from Nubar. The 8 colours capture the flawless craftsmanship of the ancient handmade glass of Venice. Each autumnal shade contains an opaque glass-flecked shimmer to give a delicious metallic finish. Unlike other metallic polishes that can look streaky and leave brush marks, Nubar’s ne w foil polishes use micro glitter and metallic pigment to achieve a smooth metal finish for your nails. Vino is a gorgeous colour! fab shades for the party season and your blogg site is amazing, i best get to work on mine! heyy! i lovee nail varnish like you! and your blog!